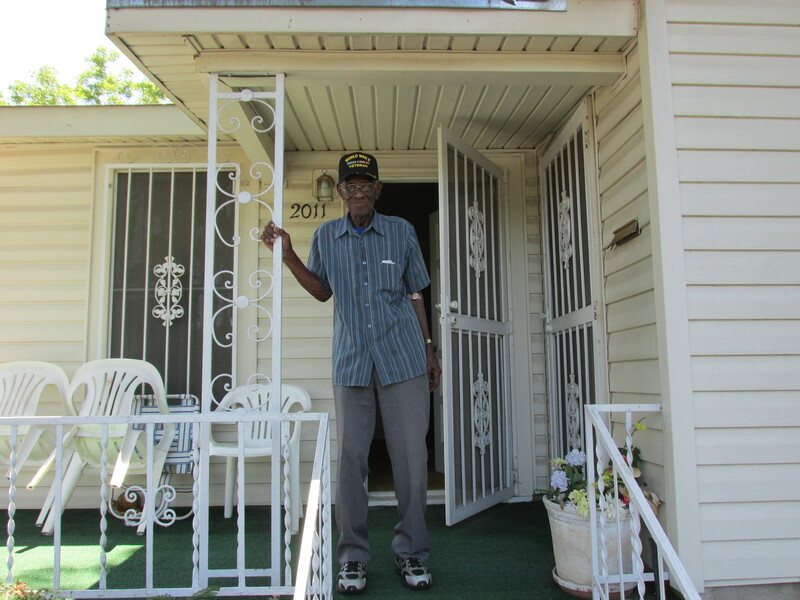 Richard Overton, 107, at his home in East Austin. Richard Overton was born May 11, 1906. That makes him 107. While notable itself, what is most interesting is Overton is the oldest World War II in Texas. Last week I spent an hour visiting with Overton at the modest home he built in East Austin shortly after he returned from the war. I waited a few minutes with Bergeron for Overton to return home from a doctor’s visit. Soon an old two-tone green pickup puttered up the street with Overton at the wheel. He slowly inched into his driveway, stopped, backed up, and tried again. Wearing a tan derby, Overton emerged, shuffled over in New Balance athletic shoes to greet us, and invited us inside. He was accompanied by his eighty-nine-year-old friend Erlene Love, a cheerful woman who used two canes to transport herself up the steps and through the front door. Overton sat in his favorite recliner in his living room and told what he could remember about growing up in the country and his service in the war. As he spoke, I noticed an ashtray on a side table with four snuffed out Tampa Perfecto cigars. He smokes several cigars every day. He also drinks whiskey in his coffee every morning. Overton was one of ten children who grew up in a farming family in St. Mary’s Colony, a black farming community in Bastrop County, Texas. The community was founded when former slave owners provided the two founding families with 2,000 acres of land, according to the Texas State Historical Association’s Handbook of Texas. After World War II many people moved to Austin for employment rather than endure the hard life of dry-land farming. Overton helped picked cotton on the farm and hunted quail, rabbits, and squirrels. He made money by serving as a hunting guide for wealthy folks wanting to bag wild game. “I had some bird dogs. I sold some bird dogs for $100 a dog. Anyway, these hunters they come out of town and they have no place to hunt. They come out in the country and I know all the places to hunt. Anyway, I’d go out with them. And I killed a lot of birds and gave them to them. I was a good marksman. Where these all white officers? You saw battle too. Saw combat? How did you escape getting shot? You were a good shot? Do you think you shot some of the enemy? Are you proud of that service? “I was proud when I got out. When I got in it was all nerves. I didn’t know. I’ve never been a war. But I could always shooting a gun,” he said, his hands clasped on his lap as he sat in his padded chair. Lately, Overton has become a celebrity of sorts. In May, the Austin City Council passed a resolution in his honor. On Memorial Day, Gov. Rick Perry paid a visit, sat on his front porch, and talked with him while reporters and TV news cameras took it all in. The governor brought gifts: a box of cigars and a pint of Maker’s Mark whiskey. What do you think of all the attention you’ve gotten lately? “Really surprised. It helped me a whole lot. I ain’t got nothing but it helped me. You know that you have outlasted just about everybody? You’re the oldest WWII veteran in Texas and one of the oldest in the country. Bergeron motioned it was time to go. Overton needed to eat his chicken wings for lunch and rest. But first a few photos. “Just help yourself,” he said when I asked to shoot his picture. I reached for my camera. “Are you going to eat now?” Bergeron asked. “No, I’m going to take my picture. Oh Lordy,” he said. Great profile of a Texas Treasure. Thanks for profiling Mr. Overton.